【ADJUSTMENT LENS】This 3d headsets lens use advanced nanometer material, with ajustable pupil distance(PD) and focal distance(FD), easy to focus and suitable for 0-800°near-sighted and 0-500° hyperopia users, greatly reduced fuzziness, dizziness when you watch 3D movies and games, better to enjoy immersive virtual reality experience. 【EXTENSIBLE EARPHONES】With individual extensible handle, adjust your earphones freely. This vr glasses earphones cover soft and comfortable memory sponge, prevent the pressure from earphones, brings you high quality stereo sound. 【MULTIPLE HEAT-DISSIPATING DESIGN】There have 6 places for air diversion in this 3d vr headset case to provent high heat focus on your phone; The face side of headset have retractable function which use high quality ventilation hole leather, reduce face uncomfortable feeling for long time wearing. 【T SHAPE STRAP DESIGN】Different from other headset glasses, this virtual reality headset with adjustable T-shaped strap, more conform to human engineering, which decrease the pressure around your eyes, face and head, you can enjoy your 3D movies and vr games without tired and comfortlessness. 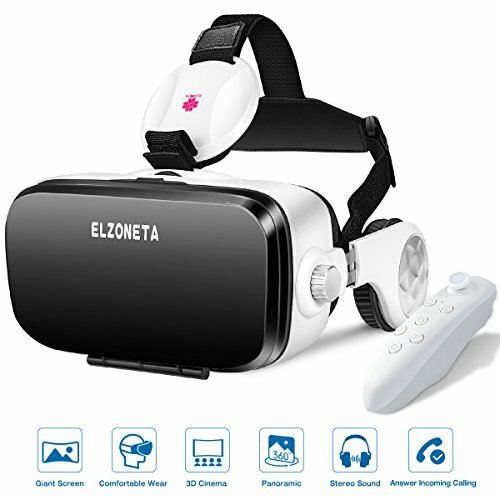 【WIDE SMARTPHONES CHOICE】With large space design at this vr phone headset with remote, it fits cell phones size from 4.7-6.2 inches. Not only fit for iPhone 6/6S/6 plus/7/7 plus/8/8 plus/x; Samsung S5, S6, S6 edge, S7,S7 edge, Note 4, 5; but also fit for LG G3, G4, G5, G6, V10, V20; Nexus 5, 6P etc. Moreover, if you use the phones in size from 5.5-6.2inches, the image will be better.